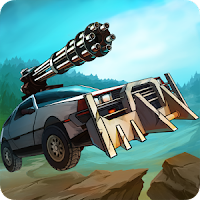 Zombie Derby 2 (MOD, Unlimited Money) - Death Race are waiting for you! In this game you are given the opportunity to pass on the most filled city that simply swarming zombotoy. In this game, you sit behind the wheel of the iron monster, and start your thorny path to victory. in your way will be thousands of zombies who want to eat your brains.